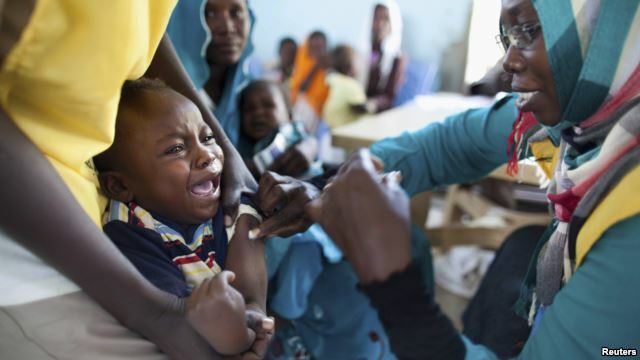 The World Health Organization warns thousands of people in Africa could die of meningitis next year if drug companies do not increase production of life-saving meningitis C vaccines. WHO says Africa is at risk of a large meningitis outbreak next year in the 25 countries that constitute Africa’s meningitis belt. The U.N. agency is calling for vaccine manufacturers to step up production by 5 million doses before the 2016 meningitis season starts in January. Unfortunately, this appeal appears to be falling on deaf ears, according to William Perea, an epidemiological officer with WHO. Another problem is price. Meningitis C vaccine can cost between $30 and $50 a dose, much higher than meningitis A vaccine, which costs about 60 cents a dose. Meningitis is a bacterial infection that can cause severe brain damage. It is fatal in 50 percent of cases if left untreated. The introduction of a vaccine against meningitis A in 2010 has successfully protected millions of people in Africa from getting this disease and prevented its spread. Meningitis C has not been seen in Africa since the 1970s; however, cases of the disease have been rising since it re-emerged in Nigeria in 2013 and 2014, and in Niger this year. WHO reports 12,000 cases of meningitis C and 800 deaths in Niger and Nigeria in the first six months of this year. GlaxoSmithKline and Sanofi Pasteur are the two leading manufacturers of the meningitis C vaccine. WHO’s Perea tells VOA the manufacturers say they do not have the capacity to increase production. The World Health Organization plans to convene an expert meeting in October in Geneva to try to understand why meningitis C is reappearing in Africa after an absence of nearly 40 years. It says many questions have to be answered for health officials to be able to control this disease.